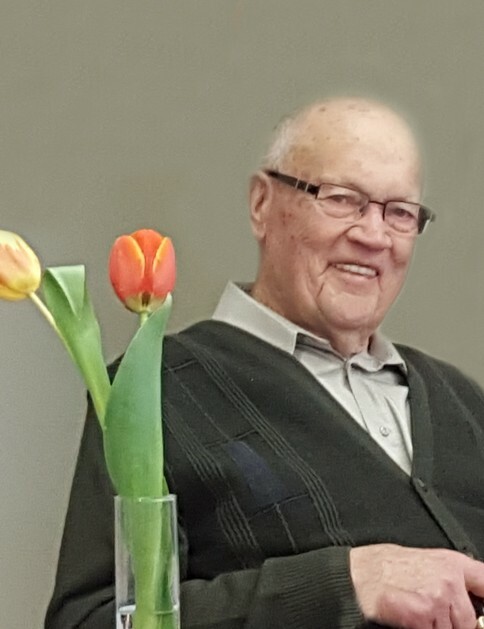 Don MacDonald, beloved husband, father, grandfather, great-grandfather and brother passed away at Rose Villa, Rosetown, Saskatchewan after a lengthy struggle with dementia. Don was born on the family farm near Chipperfield and went to Aird School. He excelled in track and field and played softball. He began his farming career as a very young man on the MacDonald homestead and loved farming his whole life. In 1951 Don married Jean McIntyre of D’Arcy. They raised their children on the farm and lived there for 60 years until moving to Rosetown in 2014. Don was a school trustee at Aird school, volunteered for the United Appeal, and served as a councillor for the R.M. of Monet. He was politically active, including in West Fed and the Western Canada Concept. Don and Jean enjoyed many happy times at Emma Lake with extended family, neighbours, and friends and later at their cabin at Mistussine on Diefenbaker Lake. They also travelled to Maui for many winter holidays and visited Don’s sister Edith and her husband Dave in Scotland twice. Another highlight was a family gathering in Banff every five years to celebrate their wedding anniversary. Don loved fixing, inventing and creating. He enjoyed the challenge of reviving tractors and anything mechanical. His grandchildren have many fond memories of being driven around the farmyard on his latest tractor project. He was also a woodworker, carpenter, amateur electrician, plumber and general handyman. He was an avid reader and loved poetry and history. Both living on the farm and at the Oasis in Rosetown, Don and family were very thankful for the wonderful neighbours and friends he was blessed with. Don was predeceased by his mother Edith (1933), his father John (1966), his sister Edith and husband Dave, and sister-in-law Bonnie. Don is survived by his loving wife, Jean and their five children, 21 grandchildren and 17 great-grandchildren. The eldest, Doug, wife Penny (Collins), their three children Adam, wife Karen, children Jack, Julie, Elizabeth; Jennifer, husband Jon Fehr, children Shayna, Nadine, Jacob, Cailean; Melissa, husband Jared St. John, children Rhett, Iain, Owen. Gail, husband Mark Wartman, their two children Alaina, husband Jeff Harrison, children Mairi, Enid; Daniel, wife Devon. Brad, wife Kathy (McKillop), their three children, Amanda, husband Kris Kotzer, Melanie, husband Mike Kahovec, children Kade, Reid, Elle; Heather, husband Jeremy Helgason, children Abel, Mac. John, wife Rhonda (Gray), their four children, Parker, fiancé Nancy, Carson, wife Brooke, Kendra, Jessa. Susanne, husband Mark Reed, their nine children, Colin, wife Aimee, David, wife Melanie, Emily, Catherine, Natalie, Sam, Sonya, Grace, Peter. Don is also survived by sister Jessie (Bob) Salkeld, brother Bruce (Dorothy) MacDonald, brother-in-law Bob (Roz) McIntyre, sisters-in-law Bernice Goldie, Audrey Mantoani and many nieces and nephews. Don had a strong quiet faith in his Creator. “What does the Lord require of you? To act justly and to love mercy and to walk humbly with your God.” Micah 6:8. Funeral service was held at 2:00 p.m. Tuesday, April 17, 2018 at Rosetown Alliance Church with the interment earlier on the same day at 10:00 a.m. at Greenan Cemetery. Donations in his memory may be made to The Wounded Warriors Weekend Foundation, Box 2666 Nipawin. SK., S0E 1E0, www.woundedwarriorsweekend.org or Stars Foundation Hangar 21, Airport Rd, Saskatoon SK S7L 9Z9, www.stars.ca.